Here is a great kit! So great that I never even play it! Ugghhhh. 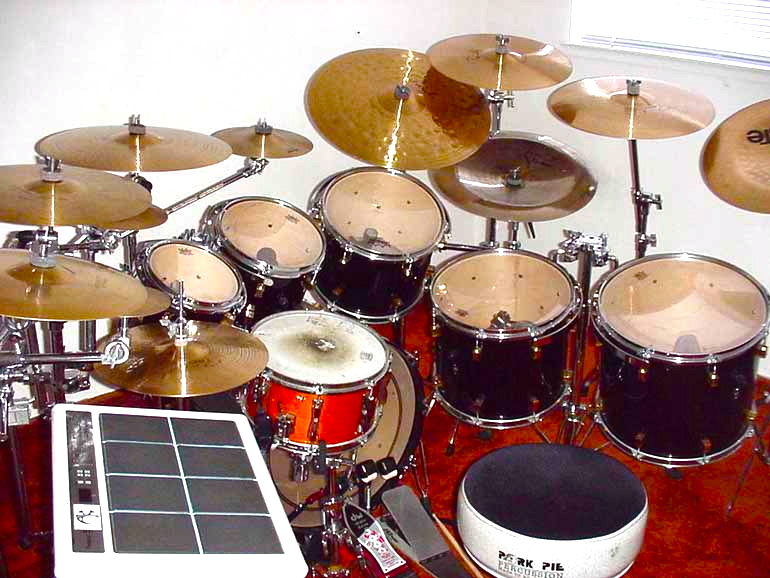 I should take it out once in a while I guess… The last time I had the kit set up was in 2002… Want to hear this kit? Me too. Hire me to do a session! 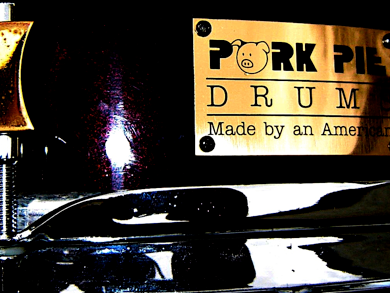 This Pork Pie kit is 100% maple and lacquer finished in a deep (almost black) burgundy sparkle. 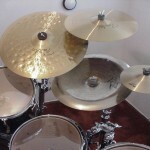 It has all brass/low mass lugs and all toms are RIMS mounted. 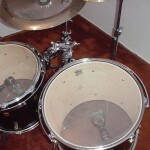 The drums are in excellent condition. 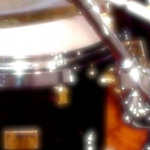 The drums are all serial numbered around the 100 area making them a serious collector piece. Other evidence of their early pedigree is the lack of “pirate wear” on the pig. 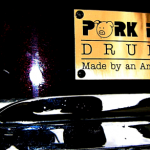 Only the early Pork Pie kits feature the “civilized pig” logo. 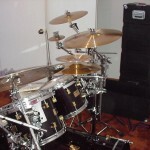 The other impressive feature of this kit is the inclusion of a full MAY/EA micing system. 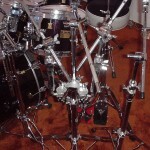 Every drum has a mic installed with a male XLR jack attached to the shell. 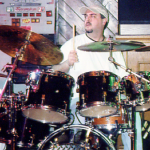 Did I mention the the previous and original owner of these drums was Brain. 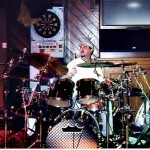 Brain has played withTom Waits, Primus, and also Guns and Roses. I found the kit on eBay and made my bids. I was looking for a large Porkpie kit for months and when this one appeared I could not resist. Own a piece of rock n roll history. 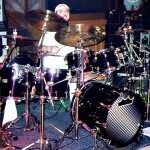 Brain (Primus) is selling his custom 7-piece Pork Pie kit at Bananas. 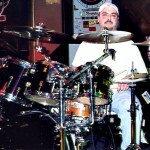 The kit was custom designed and built to Brain’s specifications. 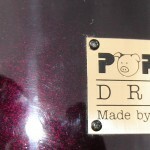 It is 100% maple and lacquer finished in a deep (almost black) burgundy sparkle. 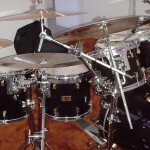 It has all brass low mass lugs and all toms are RIMS mounted. 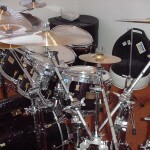 The heads are all new (or almost new) and the drums are in excellent condition. 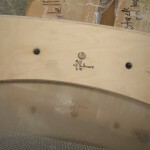 The other impressive feature of this kit is the inclusion of a full MAY/EA micing system pre installed. 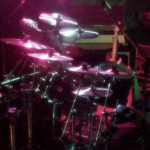 Every drum has a mic installed with a male XLR jack attached to the shell. 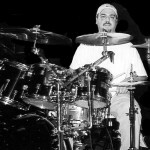 If you are a touring or recording drummer you will appreciate this time saving feature. 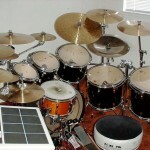 If you are collector, connoisseur, or touring/recording drummer, this is the kit for you!